I am pleased to report that during my first year as a Light Millennium NGO Representative to the UN/DPI, not only did I learn quite a few things from my attendance of several conferences, but I hope I was also able to contribute some ideas for the benefit of the United Nations as well as public at large. 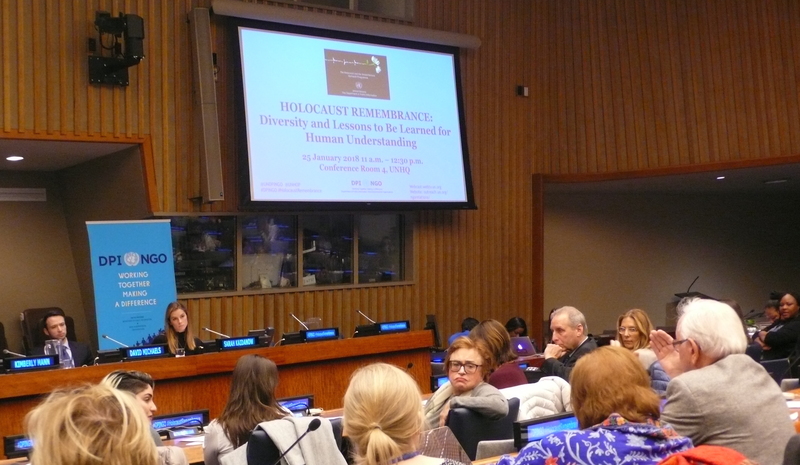 It was a pleasure for me to attend on 25 January 2018 a Briefing about learning from the past through Holocaust remembrance and embracing certain values to help prevent such acts of terror from recurring in the future with an exact title of “Holocaust Remembrance: Diversity and Lessons to be Learned for Human Understanding.“ I expressed my “lessons learned” from attending this particular conference in my article entitled: #REMEMBER: NEED TO PROTECT THE HUMAN DIGNITY AND HUMAN RİGHTS OF ALL PEOPLE. Because, there were 17 SDG’s that were listed in this teach-in raging from “No Poverty” to “Gender Equality,” to “Quality Education,” and finally “Partnership“ (with Civil Societies) to achieve the goals, among other laudable goals. While these are indeed Laudable goals, I do remember a session on “Unreasonable Goals” and how to make them reasonable if so. If a president of a country can say a racist or an unusually harsh cuss word or claim on a national television that he can shoot somebody without any consequence, all under the protection of the so-called “freedom of speech“, “without any accountability for his utterances”, then there must be something wrong with that picture. Actually, in the US, it is supposed to be that “hate speech” or “call to violence” as such is not protected by the First Amendment of the US Constitution. And yet they go unnoticed in the market place. With all due respect to the court system in this country, I submit that the courts are derelict in carrying out the laws of the land. If I may put it in a larger sense, if such unfettered “freedom of speech” is allowed under the tutelage of democracy, then there surely is something wrong with that picture and that there is a need for a more “perfect democracy”- borrowing from Obama when he used to say that we should strive for a “more perfect Union” in this country. 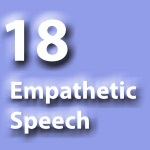 Hence, I would add another category to the 17 SDGs which might say, “Empathetic Speech,” that is, speech devoid of incendiary or racist lies and hate speech. Hence my placard for the 18th SDG in the last place below which can be discussed at an internal NGO conference later. “Empathetic Speech” proposal as the 18th Goal in the 2030 Agenda, it may be incorporated as it has reflected in the below SDGS Poster. Aside from these conferences, I attended some other briefings such as the one on Science and Technology where the transfer of technology from the laboratories can be successfully entered into the daily lives of public at large for enhancement of human condition through encouragement of especially the youth involvement irrespective of gender. 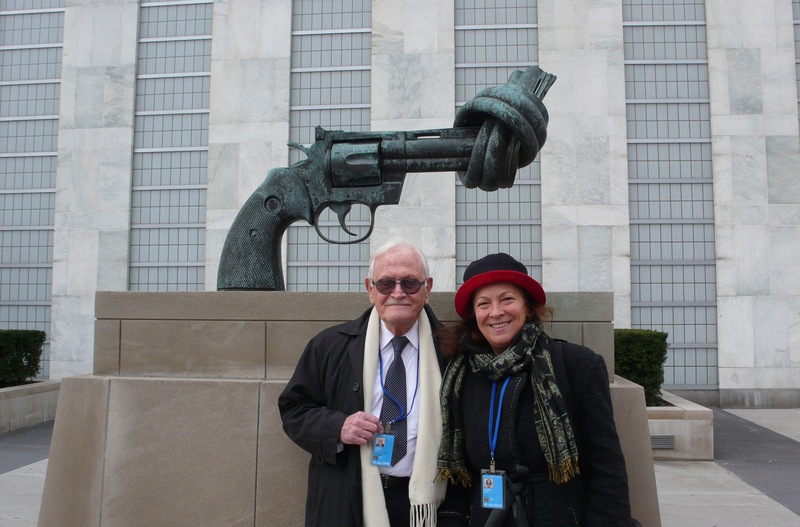 Sevgin Oktay with Bircan Ünver in front of the “Tied Gun” sculpture at the UN HQ follow by receiving the 2018 Annual Ground Pass on February 12. – Posted on November 18, 2018. ©Turkish Library Museum is under the umbrella of The Light Millennium Organization, which is officially formed based in New York in 2001. NGO Associated with the United Nations Department of Public Information since 2005.